Have you perfected ahimsa (non-violence)? How did I come take up Ayurveda? Why do we pray to Lord Ganesha? Are you learning just to teach Yoga? Pandit Vamadeva Shastri: A Modern Rishi - NEW! A Note on Meditation - NEW! 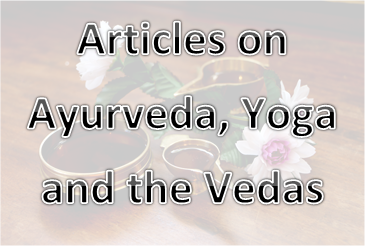 How to find an Authentic Ayurvedic Practitioner? The Expressions of Samadhi: A Traditional Yogic Understanding of Samadhi NEW! Cultivating Dharana: The Key to Meditation NEW! Specifics of mantras: What mantras to use? On Marmas and "Kerala Ayurveda"
Revisiting Satan: What Does it Mean to a Hindu? The Myth of "God" in Hinduism- NEW! 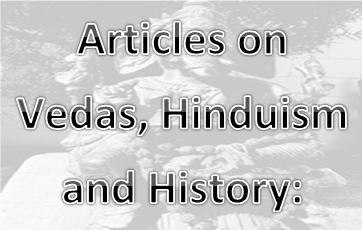 Narakas are not "Hells" in Hinduism - NEW! Where Does Our True Dharma Lie? ﻿Vedas from Early Tamil Sangams? Failures of Western Science: Christianising Dharmic Faiths and their Sciences NEW! Notes on Rig Vedic Symbolism (Opens in PDF Window).